This is a preview of an event with Marcus Westbury at our New York City offices on February 8, 2011 . Nowhere have Lighter, Quicker, Cheaper interventions been more elevated to a city-wide, cohesive revitalization strategy than in Newcastle, Australia. Decades of decline left the city's CBD riddled with vacant properties and lacking vibrant public life. Yet, less than two years after interventions facilitated by Marcus Westbury’s Renew Newcastle campaign, the city has been catapulted to Lonely Planet’s List of Top 10 Cities to Visit in 2011. PPS has also lead Placemaking training in Newcastle in late 2010 where we witnessed some of Marcus's impacts. Newcastle's success points to signs of a growing international movement towards iterative, creative development strategies that harness the creative power of the local community. In his interview with us, Marcus Westbury revealed key insights on how to catalyze district-wide revitalization. Our full conversation follows. Create dynamics that foster experimentation rather than expecting solutions to arrive fully formed.Do the leg work required to be familiar with right kind of legal agreements, management structures, and governance needed to bring about LQC projects in your cityA “network of networks” approach to outreach is a really effective way to recruit the merchants and artists necessary to enliven a district. Use multiple means to reach a broad group of people: Facebook, the local media, public meetings, and Etsy.comDon’t overlook large property companies. They can be unlikely but powerful partners and, because they often own a lot of land, can provide access to the critical mass of places necessary to revitalize a whole districtHealthy, dynamic public spaces are very important for healthy cities. However, you need to be careful to get beyond the idea of cosmetic improvements and actually create new dynamics that generate more interesting and engaging public spaces.Part of the challenge is to see your liabilities as opportunities and find the fastest, cheapest, most effective way to get them activated.By all means dream up all the great, fantastic, capital intensive schemes but make sure than while you’re doing that you don't neglect the small stuff. Do enough of the small stuff and the big stuff starts to take care of itself. PPS: Tell us about the transformation Newcastle has undergone. What does it feel like to walk down the street today compared to two years ago? Westbury: The area where we have been mainly working – which is a 3 or 4 block stretch of the city centre around the Hunter Street mall has changed dramatically. When we began at the beginning of 2009 the strip had more than 20 empty shops in that area – a number that had been growing every year since the 1980s. Today there are only a handful still empty. In the last two years we have used those spaces and the spaces around them to incubate 60 new creative projects and enterprises of various kinds – many of which are still in the area.Newcastle has galleries, fashion designers, studios, small publishers, and dozens of other arts projects and creative enterprises that would not have otherwise been there as a result of Renew Newcastle. That is building a vibrant creative community that is in turn building new creative and economic life in the city. 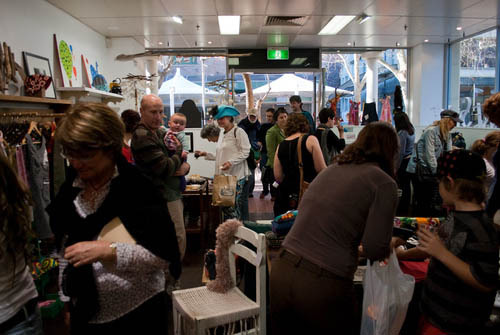 Today if you visit the Hunter Street Mall area it is full of new commercial tenants that have moved back in following the foot traffic that has been generated by Renew Newcastle. One estimate was that the foot traffic had tripled. PPS: How do you foresee the project evolving in the next 2, 5 and 10 years? Westbury: As for the long term, I have always described Renew Newcastle as “a permanent structure for temporary things” – we aren’t aiming to own properties or even make a claim over a particular area. The Renew Newcastle model is to constantly provide new spaces for experimentation and incubation- as we have done more than 60 times already. Some of those projects will succeed some will fail, but the point is to unleash experimentation. Our role will expand and contract with the number of empty spaces available – some of our project will be there in 10 years time but many probably won’t be. As an organization we are actively moving into new parts of town, trying to build new clusters in new precincts and hopefully launching many new projects and initiatives. We have a reasonable amount of turnover so it’s always a rapidly changing dynamic. Further afield, I’m personally working with other cities and towns to see if we can repeat the same process there and there is evidence from some other parts of Australia at least that it can and does work. PPS: How were you able to build faith for the implementation of your vision? Westbury: I’m not entirely sure of that. I accidentally backed into it in many respects! The key thing was working quietly behind the scenes to get the details right. We had to get the right kind of legal agreements, the right kind of management structures, the right kinds of governance figured out. From there we went about convincing key stakeholders from the local media, the business chamber, the creative community and elsewhere to sign up to the same project. A lot of that was about breaking down the “zero sum game” idea that had often polarized people with very different ideas of what was appropriate development in Newcastle. We had to convince a lot of people that for someone to win someone else didn’t necessarily need to lose. PPS: Where did the merchants/artists come from? How did you recruit them? Westbury: A variety of places. Most broadly it was a network of networks. Both myself and Marni Jackson (Renew Newcastle’s General Manager) had a background as festival directors so that gave us some good networks but in reality very few of the people who took up the opportunities were ones that we actually knew. Most came out of the woodwork through public meetings, through the media, through facebook (our group has over 3000 members), through contacting local sellers from Etsy.com – it was a very broad approach and very deliberately so. Many of our projects were what I call “digital cottage industries” – people who were making clothes and selling them at markets, people who were running online enterprises from a spare room, some were online communities – such as local photographers who had been connected on Flickr previously – that came together around a physical space when offered. PPS: What unexpected partners made the biggest contributions? Westbury: Our most unexpected big contribution came from the GPT Group, a large Australian publicly listed property company. They gave us the keys to dozens of properties that were lying empty as a result of the financial crisis stalling a major development they had planned. Their properties gave us an immediate critical mass that made a huge difference. They have reaped the benefits on several fronts – they’ve turned a liability into an asset, their other properties in the area have become far easier to rent, they have gotten great publicity and the genuine respect of the people we have been working with, we have jointly won several awards, and they – and now some of their competitors – are actively looking at how they can deploy the same model elsewhere. PPS: What were your initial biggest hurdles regarding government, property owners, etc? How did you overcome these challenges? Westbury: Badly designed incentives. There are a myriad of incentives for property owners not to make available their empty properties – Newcastle had more than 150 empty buildings in the two main streets in large part because owners were better off to board them up and write off the losses than use them as going concerns. Essentially, Renew Newcastle exists as an intermediary designed to change how that process works – we use some clever but legal contracts and risk management processes to make that work a lot better. We manage risk and remove complexity which is essentially the key to it. In many respects, on the surface, Renew Newcastle looks like an arts and cultural project – and it is - but from my end it is really a series of mechanisms for changing access to and governance of space. We have changed how space behaves for creative people and they in turn have brought their creativity and innovation to the problem of bringing the city back to life. PPS: Many places around the world boast pockets of creative activity. What makes Newcastle stand out? Westbury: In many respects Newcastle is very similar to a lot of former industrial cities around the world. It has about half a million people in the area, it was once home to heavy industry that is gone. On the upside I think Newcastle has always had a strong DIY creative culture which helps. It has some great features – it has old city centre still relatively intact, it’s on the beach – an old mining and port town, it has a bit of the “second city syndrome” compared to Sydney which is two hours down the road. Also, in an odd kind of way it has long been politically and practically ignored – which means it’s a good candidate for finding its own way of doing things. PPS: How did you go about catalyzing creative collaboration amongst the artists and the surrounding community? Westbury: Strictly speaking, we don’t. Renew Newcastle isn’t in the business of organizing collaborative projects or actively engaging in running collaborative projects. We work with and facilitate people who do but the process is actually quite organic and spontaneous not driven by us. The projects that we work with and broker space for organize all kinds of projects and collaborations and we help them. We don’t run community arts projects in the traditional sense though. ‍In Newcastle, formerly vacant storefronts are now community destinations that support the local economy. PPS: How has the revitalization impacted the surrounding public spaces? How do you see the role of public spaces in creating new energy in neighborhoods/cities? Westbury: There is a greater degree of activation of and pride in public spaces although we don’t approach it from that end. The activation of public spaces is an outcome and a byproduct rather than a specific aim of our approach. We bring creativity, creativity brings experimentation and innovation, experimentation and innovation bring activity and that activity spills over into the public realm – both formally and informally. Healthy, dynamic public spaces are very important for healthy cities. However you need to be careful to get beyond the idea of cosmetic improvements and actually create new dynamics that generate more interesting and engaging public spaces. In Newcastle’s case there has been many millions of dollars spent on physical improvements to the public realm that made little difference to the underlying dynamic. The danger is that communities can end up with superficial improvements that paper over structural problems – I think public spaces work best when they are the outcome of vibrant communities. PPS: What lessons have you learned through Newcastle and what advice would you give to zealous nuts who aspire to transform their communities? Westbury: I keep going back to the need to think about and work with the underlying dynamics. How incentives work, how spaces behave, how practical initiative can take root – or what is preventing it from doing so. I tend to be suspicious of single grand visions and a big believer in experimentation. In Newcastle’s case rather than try and define “the answer” we have tried to create a dynamic where we seed a lot of experiments – more than 60 at last count – and see what works. I’m a big believer in creating dynamics that foster experimentation rather than expecting solutions to arrive fully formed. Also, I’m a big believer in cheap. Part of the challenge is to see your liabilities as opportunities and find the fastest, cheapest, most effective way to get them activated. By all means dream up all the great, fantastic, capital intensive schemes but make sure than while you’re doing that you neglect the small stuff. Do enough of the small stuff and the big stuff starts to take care of itself. PPS: How does your approach differ when dealing with artists, merchants, government officials, developers, etc. and how have you rallied these groups to collaborate around shared community vision? Westbury: Mostly it doesn’t. We are very transparent when dealing with each party – I think it’s important that each party sees what the other is getting out of it and why. Obviously there are some differences in language and emphasis depending on whether you are talking to a publicly listed company, a small shop owner, an artist or a community group but fundamentally the proposition is the same. We take space that is otherwise empty, we find creative people to care of it and activate it and give it to them rent free, those people incubate their own ideas and passions, through that we make places interesting and active, and if and when the owner wants it back they can take it. There’s no rent but no security – if the tenant wants security beyond our rolling 30 days they can start paying rent. It’s transparent, simple, and in many respects obvious but what we also do is manage the complexities of it: the liability, insurance, risk, the big complexities, the trivial management issues, curation of projects, the finding of the best possible projects and people, the permits, and all the rest of it. We make it easy and the process is one where it should be transparently obvious to everyone why people are doing what they are doing. PPS: Who are you targeting through Renew Australia and what services will you be offering? Westbury: We are establishing a national, not for profit social enterprise that will offer training and consultancy services. We are aiming to work with governments of all levels and with property owners, economic development agencies, developers and others to deploy creative initiative based projects in different communities around Australia – and perhaps further afield if people are interested. Want to talk with Marcus? Come visit our NYC office on February 8 at 6PM. RSVP now!